CSL standing next to DA Tom Zugibe four years ago. Zugibe would go on to assist the FBI in their investigation of the supervisor. US Attorney Preet Bharara praised Zugibe for his assistance in his investigations at his April 14 press conference. April 28, 2016–When Ramapo Supervisor Christopher St. Lawrence was arrested two weeks ago, U.S. Attorney Preet Bharara said it was the first municipal-bond related criminal securities fraud case brought against a public official. St. Lawrence was charged with 22 counts of securities fraud, wire fraud, and conspiracy for selling over $150 million in municipal bonds on fabricated financials. Those defrauded included the citizens of Ramapo and thousands of municipal bond investors around the country. The case will probably not get to court until next year, but hopefully, by that time, the New York State legislature and/or Governor Cuomo will have begun a long-overdue reform of New York’s Local Development Corp. law, which has enabled ethically challenged politicians like St. Lawrence across the state. Although the case is unique, the steps leading up to the indictment were pretty much standard operation for the FBI and the U.S. Attorney. In other words, slow steady progress that can be torture for those waiting for results, and then, finally, cases are bolted down with hardened evidence. Then, at dawn, on April 14, FBI agents escorted St. Lawrence out of his home and took him to the federal courthouse in White Plains, where he would wait for the late afternoon arrival of his co-conspirator Aaron Troodler to arrive from his home in Pennsylvania. The charges were outlined in two indictments. One was brought by the Securities and Exchange Commission (SEC v. Town of Ramapo, et al, case number 7:16-cv-02779), and the other was a criminal complaint brought by the United States of America v. St. Lawrence, et al., (case number7:16-cr-00259-CS). Two complete sets of charges combining 22 counts, each with serious federal sentencing guidelines attached. Added to the list of those to be prosecuted are Michael Klein and Nathan Oberman. And what were the authorities doing all that time since the May 2013 raid? Well, one week after the arraignments, St. Lawrence and Troodler were called back in to make arrangements to have their attorneys get a look at the evidence against their clients. The evidence includes years’ worth of audio recordings, video and photos, and documents–205,000 documents. We estimate, using a Lexis-Nexis formula for average legal documents that they store, that these 205K documents likely contain up to 1.8 million pages. That’s what the investigators were doing for the three years. And probably, given their mode of operation, they were developing other lines of investigation as they worked the slow process of calling people in for interviews. The attorneys for the defendants asked for 120 days to review the evidence, but Judge Kathy Seibel gave them 90 days to complete the pre-trial fact-finding process. She also set the next court date—July 21, at 4:30 p.m. in White Plains. So after the long wait, we now have the full force of the US Department of Justice on one side backing the most successful New York corruption clean-up team in recent memory, and on the other, currently obscured from view by an Everest of evidence, is St. Lawrence, Klein, Troodler, and Oberman. The Town Hall investigation and charges have now become one part of what seems to be a branching federal operation. Coming as a complete surprise to just about everyone, there was a second large FBI raid on March 16, four weeks before St. Lawrence’s arrest. The raid involved six times as many agents who spread out throughout Monsey and Spring Valley. The search warrants they carried ordered vendors and yeshivas to provide “records and account for equipment allegedly bought by religious schools with millions of federal education technology dollars.” Twenty-two schools and businesses were closed as agents from the FBI’s ERT and computer division spent late morning to early evening hauling out computers and files. Then, perhaps just coincidentally, five days after St. Lawrence’s arrest, Preet Bharara announced the arrest of Alex Lichtenstein. The Pomona resident is charged with bribing members of the New York City Police Department’s License Division to get 150 gun licenses that he sold to customers. The bribes were $6,000 per license. The U.S. Attorney’s office explained in the complaint that Lichtenstein was a member of the Borough Park Shomrim, “a volunteer, ostensibly unarmed Orthodox Jewish patrol society whose mission includes combating criminal activity and locating missing people.” Lichtentstein faces a possible maximum sentence of 15 years for bribery and conspiracy. Is this arrest in any way connected with the other investigations going on in Ramapo? Probably, we won’t know until the evidence is made public in court appearances, and we can begin to connect lines and/or people. 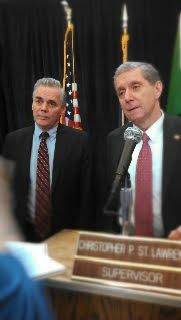 Having invested a dozen years closely following St. Lawrence’s destructive policies, and reporting those to whatever agency might be responsible for legal oversight, it’s hard to imagine a better outcome than what we are seeing now–federal charges and an active FBI presence still investigating Ramapo. It’s taken a long time, but it’s finally in the hands of the agency that would have been our first choice from the outset. Michael Castelluccio is one of the leaders of Preserve Ramapo and editor of www.Preserve-Ramapo.com. He has been on St. Lawrence’s trail for a decade.